They will have been talking for over an hour by the time MONICA arrived. 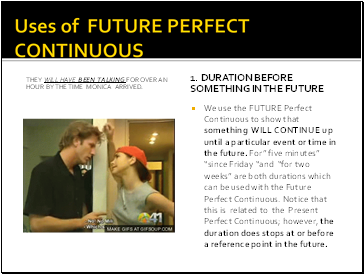 We use the FUTURE Perfect Continuous to show that something WILL CONTINUE up until a particular event or time in the future. For” five minutes” “since Friday “and “for two weeks” are both durations which can be used with the Future Perfect Continuous. 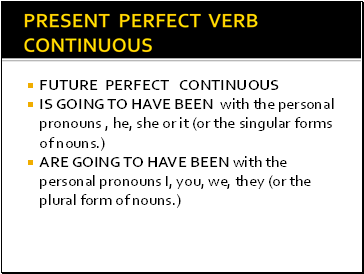 Notice that this is related to the Present Perfect Continuous; however, the duration does stops at or before a reference point in the future. 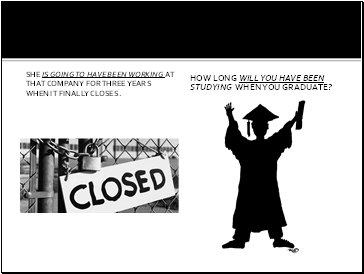 She is going to have been working at that company for three years when it finally closes. manny will be tired when he gets home because he will have been jogging for over an hour. 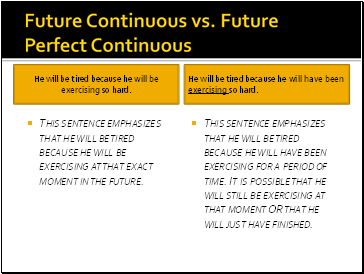 Using the Future Perfect Continuous before another action in the Future is a good way to show cause and effect. 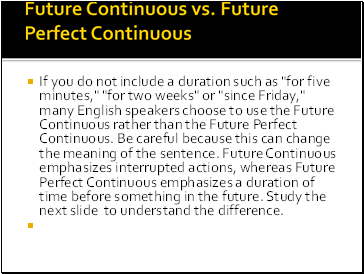 If you do not include a duration such as "for five minutes," "for two weeks" or "since Friday," many English speakers choose to use the Future Continuous rather than the Future Perfect Continuous. Be careful because this can change the meaning of the sentence. Future Continuous emphasizes interrupted actions, whereas Future Perfect Continuous emphasizes a duration of time before something in the future. Study the next slide to understand the difference. He will be tired because he will be exercising so hard. 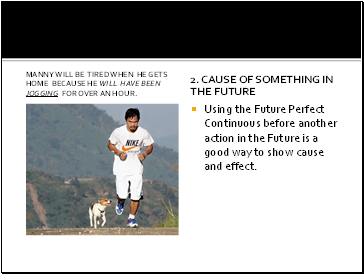 This sentence emphasizes that he will be tired because he will be exercising at that exact moment in the future. This sentence emphasizes that he will be tired because he will have been exercising for a period of time. It is possible that he will still be exercising at that moment OR that he will just have finished.